I’ve been consumed by and consuming one book this past week, and it seems fitting to write about it on International Women’s Day. Roma Harris’ Librarianship: The Erosion of a Woman’s Profession is, at its core, a defense of women. 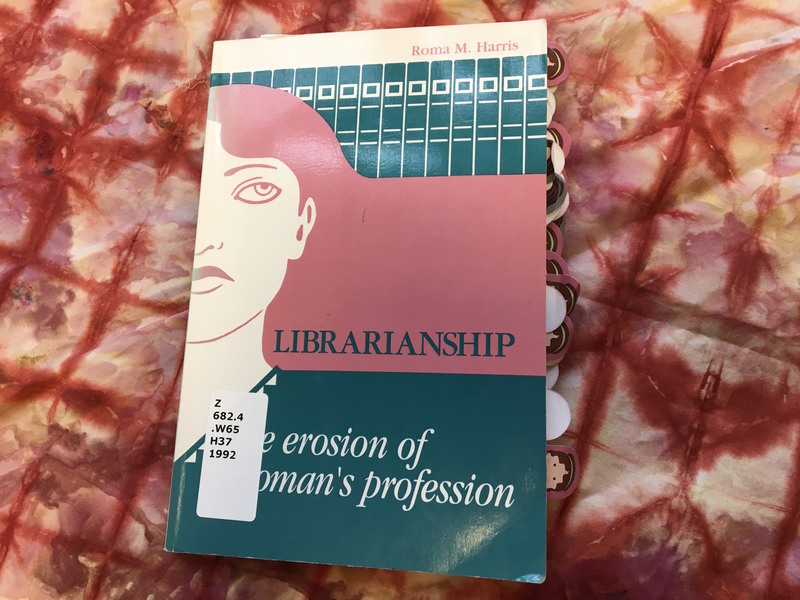 Harris deconstructs the “problems” within librarianship and argues that they are fundamentally rooted in the field’s feminization within a sexist society that undervalues and dismisses women and women’s work. This book was published in 1992, but it is still. so. damn. relevant. Every other page is flagged, copious notes have been taken, and I may have even underlined one or two things (in pencil, lightly). In an ambitious content analysis of the library literature, Bennett observed what he referred to as a “mea culpa” convention in the field, that is, the “criticism of librarians, libraries, and librarianship by librarians themselves” …librarians often blame each other for what are, in fact, externally imposed barriers to progress…Some turn their anger inward, pointing accusing fingers at one another for being too feminine, too masculine, or not enough of either. Others see that the barriers to progress are externally imposed and choose to fight back or leave these professions entirely. As I read this chapter, all I could think was, Yes. Yes to all of this. I am often a self-doubter and a self-blamer, and, when things get really dark, a self-denigrator. I question my parenting choices, my career decisions, and my day-to-day existence as a woman. I wonder if I couldn’t be living better, which, as I write it, feels a bit preposterous. You live the life you live. But in this world, even as a woman who inhabits a fair amount of privilege, it’s still easier to see myself as being to blame when things go wrong or when things get difficult. Yes, personal responsibility is important, but it’s equally important, if not more so, for the individual to be able to critique the larger system of which they are a part. But I never can seem to get beyond blaming myself. I often take all of this self-doubt and blame and transfer it from my personal life to my own work. Just yesterday I felt as though I wasn’t doing enough, wasn’t being effective enough, wasn’t making enough of my difference in my library and at my college. I know, intellectually, that I am being hard on myself and doing what my mother and countless other women often do–blaming ourselves because we’re easiest to blame. But emotionally, my ego takes over and I become the person to blame for all of the things that could be done better. I think drawing that comparison to how we treat our own profession is spot on. I find myself doing it, too, at times. I think there is nothing wrong with being critical of our profession. It’s needed to call out issues of inequity and spark creativity. But I do think there is a problem with disparaging our work in our lowest moments as being unimportant, out-of-touch, or irrelevant. Our constant preoccupation with what’s next in libraries makes it easy for us to dismiss and not build on the important work we do right now. Instead of, as Harris states, “taking the battle outside,” we fight it amongst ourselves. Take for example, my reaction at a recent conference session. Wonderful librarians were presenting on faculty development and faculty-librarian collaboration and talked about using the question “How can we [librarians] help you [faculty]?” I immediately did an inward eyeroll and thought: That’s the problem with us librarians. We keep setting ourselves up to be doormats. The problem isn’t necessarily with the critique, because unequal power relationships between teaching faculty and librarians (whatever our status) are a real thing, but with the direction of the anger. Why wasn’t my reaction: *eyeroll* That’s the problem with neoliberal educational structures. They’re all about efficiency and hierarchy, and when they combine with sexism, you get this uneven power relationship between librarians and faculty that force those kinds of questions/statements. It’s easier to blame ourselves, to encourage the librarian to be more professional, more knowledgeable, more accommodating, more MORE. It’s hard to demand change from deeply entrenched power structures. The fact that Harris’ writing still echoes my day-to-day work life 25 years after it was written is proof enough that our efforts at transforming “librarianship” into something more/better/bigger/faster/smarter are not going to save us. We don’t need the saving. The structures we exist in are what need to change. The fall semester is winning right now, and I feel sort of like I’m always 2-3 days behind where I should be. That said, I haven’t had much time for writing, but did manage to get a post up on ACRLog recently. It’s a bit too personal, perhaps overly vulnerable, and I recognize that not everyone will identify with the feelings I express in it, but it’s honest.